The holidays tend to come up quickly. It can feel like you blink and suddenly it’s December again. Every seasoned holiday lover knows it’s never too early to start preparing! 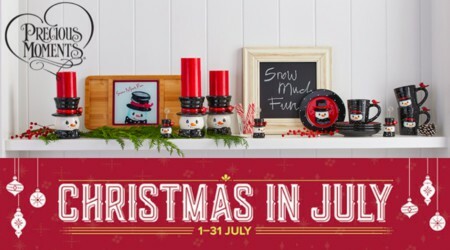 Precious Moments is celebrating Christmas in July, which is a perfect opportunity to get some of your holiday shopping started. piece by piece! The figurines themselves are made of resin, so don’t worry about any accidents. If it falls, it’s pretty easy to put back together and can be a perfect family activity! It’s a great way for all of you to bond and learn the Christmas story. Another fun activity for the whole family is collecting special dated figurines, ornaments, and musical snow globes. These pieces are just as beautiful as they are inspiring. They can be used to commemorate baby’s first Christmas, anniversaries, and much more. Create memories by giving them as a thoughtful gift to a loved one, or pass one down as tradition year after year. Precious moments introduces new designs each year, so it’s simple to keep your collection fresh and up to date. Christmas dinner might be everyone’s favorite part of the holidays, second only to opening gifts. Make sure your table is set beautifully with Precious moments’ “Snow Much Fun” tableware collection! Special holiday decorations help give your table a homey yet elegant feel that will complete your dinner. This collection has everything you need for the perfect table spread, platters, bowls, and even salt and pepper shakers. There’s even a cookie jar, a gift that keeps on giving all year long. We all know Christmas time can be stressful, sometimes even overwhelming. The earlier you start preparing, however, the more time you can spend enjoying the holidays with your family. So make sure to take advantage and knock some things off that Christmas list. 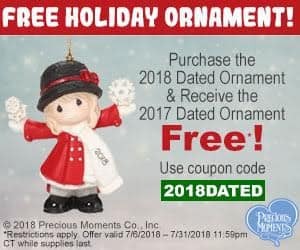 Deal: Purchase the 2018 dated ornament & receive the 2017 dated ornament FREE!